On 15 June 2018, Polisario announced that a new case has been launched regarding the EU-Morocco plans to cooperate on fisheries in the waters of occupied Western Sahara. In the EU-Morocco talks, the EU has so far ignored the two judgments from EU Court of Justice on Western Sahara. In its press release, national liberation movement of Western Sahara, Polisario Front, announces it has asked the EU Court of Justice (CJEU) to annul the Council Decision of 16 April 2018, authorising the EU Commission to renegotiate the Fisheries Protocol with Morocco. Find the summary of the application submitted by Polisario here. "Carried out within the framework of the annexation policy of the Kingdom of Morocco, these negotiations violate the right to self-determination of the people of Western Sahara, and their related rights. They will only lead to a new illegal agreement", Polisario's press release of 15 June stated. The current Protocol, allowing EU vessels to fish in the “Moroccan fishing zones” in return for an annual €30 million, will expire mid-July. On 27 February this year, the CJEU ruled that the Fisheries Agreement between the EU and Morocco was only valid insofar as it was applied to Morocco, and thus could not be applied to Western Sahara. Western Sahara, the Court stated, does not fall under Moroccan “sovereignty or “jurisdiction”, and is not part of “Moroccan fishing zones” – a notion used throughout the Agreement and its implementing Protocols. The EU-Morocco Fisheries Agreement has been in place since 2006, but gets implemented through Protocols which are up for renegotiation every four years. In spite of the CJEU judgment, the EU Commission sought a mandate from the EU Member States to open talks with Morocco for both a new Agreement and a new Protocol that would explicitly apply to Western Sahara and its maritime zone. The Member States in Council agreed on 16 April this year that the EU Commission ought to negotiate an amendment to the Agreement so as to include the waters of Western Sahara in its territorial scope, and a new Protocol as the current one is close to expiring. By the EU Commission's admission in Court, 91.5% of the EU's fishing activities under the Fisheries Protocol with Morocco take place in the maritime zone of Western Sahara and 66% of the sectoral support under the Protocol goes to Moroccan projects in the occupied territory. The map to the right was included in the evaluation report of the current EU-Morocco Protocol, and demonstrates that Morocco invested the lion's share of EU-support in Western Sahara. Click the map for a larger version. Polisario's new case is brought only a few days after the EU Commission's adoption of an Exchange of Letters with Morocco that allows for the explicit inclusion of Western Sahara in the EU-Morocco Trade Protocols. The EU Commission argues that this amendment to the Trade Protocols is sufficient to ensure their lawful application to Western Sahara. In December 2016, however, the CJEU had ruled that no EU Trade or Association Agreement could be applied to Western Sahara, unless with the consent of the people of the territory. The proposal of the EU Commission - which still requires approval of both the EU Member States and the EU Parliament - does not have the consent of the people of Western Sahara. The Commission tries to obscure the lack of consent by providing misleading information, claiming that the UN-recognised representation of the people of Western Sahara, took part in a consultation exercise on the proposal. 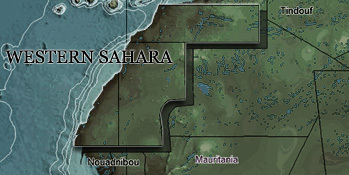 Morocco has illegally occupied a larger part of the non-self-governing territory of Western Sahara since the mid 1970s.